In many production processes the surface or interfacial tension is a decisive parameter for the quality of a product. Especially within the surface technology the surface tension has become a permanent measuring and controlling variable. Surface tension is a phenomenon between liquids and gases. It causes objects that usually sink due to their higher density to swim or that paints achive good wetting on some and collect into drops on other surfaces. Responsible for phenomenon of surface tension is the process of cohesion. Cohesion can be described as attractive (cohesive) forces or ‘stickiness’ between molecules of liquids. On the interior of the liquid (here water) a molecule experiences attractive forces equally in every direction by neighboring molecules. The resulting force value is zero. 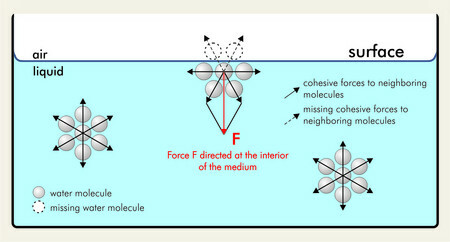 As shown in the picture, a molecule located on the surface of a liquid lacks some neighboring molecules and thus, experiences an imbalance of forces. Attractive forces of a molecule to its remaining neighbors are stronger on the surface of the liquid. As a result, a force (F) develops that is directed at the interior of the medium. Practically, the phenomenon is comparable to a thin layer surrounding the liquid and making it hard to dip an object in and to pull it out of the liquid. Against force (F) work has to be performed to move something through this layer or to expand its surface. For this reason the surface tension is defined as ‘the amount of force (Nm) necessary to expand the surface (m2) of a liquid by one unit’. Therefore, the surface tension is measured in N/m (Nm/m2 = N/m). Ocationally, the surface tension is given in dyn/cm. The surface tension of water at 20 °C is 72,75 mN/m. Nutzen Sie unsere SITA Tensiometer zum Messen der dynamischen Oberflächenspannung. Unsere Applikationsabteilung berät Sie gern.